This is the last post on this blog for a while, I don't know how long, I don't even know if I will resume. Given my nature it is likely that when I have more free time in a few years some other shiny puzzle will attract my attention. I will be putting comments on moderation in due course but will try to pop in to check them, but being very busy I might not make it as often as I'd like. This decision is because of two factors: I have my savings outside of the UK now and need to keep my eye on business matters in order to actively manage my investments. I am now on the Financial Times website far more than any climate change or sea ice related site. Also the impacts of the disastrous Brexit vote are already starting to hit UK industry and I am finding my day job takes more of my time. Something has to give, it's not going to be walking, computer gaming, mixing music, watching films, radio tinkering, so it will have to be sea ice. When the vote was made back in June I did a post entitled It's all going a bit J G Ballard. Now, nearly three months on, it is far worse. And, as I keep having to remind deluded Brexit voters, we haven't even left the EU yet! Back in 2014 I suggested that there may be an oscillation of extent loss. According to the supposed oscillation this year should have seen a large loss in August, this didn't happen. Where is the low extent coming from? Using Cryosphere Today regions, where is the low extent at present coming from? GISS global temperature anomaly data is out for April. 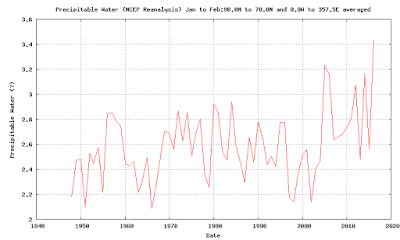 The last 7 months have been above 1degC global anomaly. 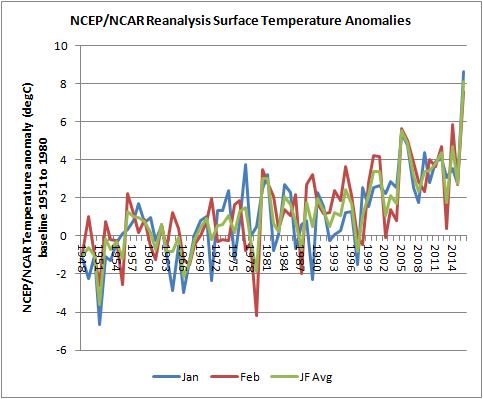 Temperature has been obtained from NCEP/NCAR as timeseries and composites. There is evidence supporting suggestions of melt ponding along the Alaskan coast, but much of the pack is cool/normal for recent years. Click on images to enlarge. How did Beaufort get in this state? In comments on an earlier post Iceman raised the question of how Beaufort got in the state it is in. As I wasn't immediately able to answer it off the top of my head I thought I had better look into it. I'll start with a recap, then go on to examine how Beaufort ended up in such a fragile state. Thanks, as always, to Dr Zhang and the PIOMAS team at the Polar Science Center for making gridded PIOMAS products available to amateurs such as myself. It's early May and April PIOMAS data is out. April is the peak of volume and ice state in April is one of the primary initial conditions that sets the scene for the coming melt season. The 2016 sea ice melt season in the Arctic has started, Beaufort starts early this year, but does this mean it is starting as it means to continue? In 2014 I posted about an apparent oscillation of August extent loss, I updated this with preliminary data in August 2015, but failed to return to the issue to see how things actually turned out. As this issue has a bearing on the post that follows, and prompted by reading a comment at Neven's blog about claimed cycles in sea ice, I am posting this to update data on last year's August extent loss. Beaufort has already started to collapse, I will have more about that in a post to follow when I have the time tomorrow. For now, I have amended images from Meereisportal for a close look at Cryosat 2 ice thickness in Beaufort. More commentary about the recent Cryosat 2 data is available from Neven at the Arctic Sea Ice Blog. The maximum has never excited me in the way the minimum extent can, but there is something interesting about it. 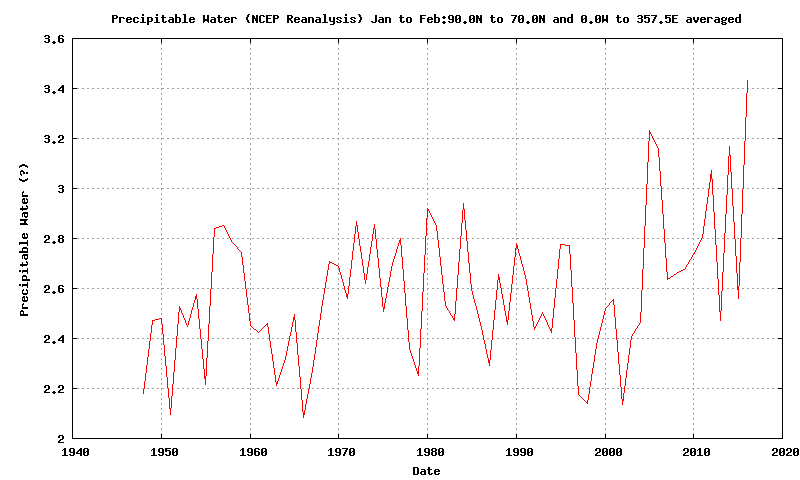 Below is a graph of Total Precipitable Water (TPW) through January and February from NCEP/NCAR. NCEP/NCAR temperature data is now out for February 2015, it shows January's staggering warmth in the Arctic continuing. Earlier this month I didn't have the time to look at January's PIOMAS data, and still don't really aim to cover PIOMAS in detail until April's data is out in early May. At that stage I will make my prediction for this year's SIPN. However I have been looking at how the volume pulse is going and thought I'd do a quick update on it. This post looks at why Northern Hemisphere (NH) sea ice extent is so low at present. A commenter Dreesen asked what I thought about it, and due to work pressures I hadn't looked at sea ice for weeks. The low sea ice is likely due to a combination of long term reduction due to global warming and weather in the North Atlantic. But temperatures in January were extreme, and I lack a convincing answer as to why. As you already know 2015 was the warmest year on record in the instrumental record, at an anomaly of 0.87degC this is a substantial new record. Anyway, for what it's worth, here are a few comments and graphs (late because I've been too busy at work). How goes the Arctic Night? Well, there's been more UK flooding, this time in Scotland, however I'm not going to get into the habit of covering every flood event, I've said all I can say at present in my my previous post. For this post I want to take a quick look at how the cold of the winter's 'Arctic night' is proceeding. Using UK annual precipitation, the probability of a very wet year has increased, from 1/6 before 1990 to 3/6 after 1990. Before 1990 a very wet year had the same probability as that for rolling one dice for the number you picked, after 1990 three sides have the number you pick.